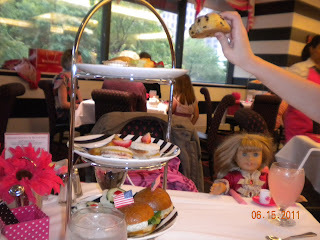 Last spring, my daughter and I went to American Girl Place for their Afternoon Tea and had a wonderful time! We ended up choosing the tea as opposed to the other dining options because of timing and my thriftiness-it is the most cost effective way to enjoy dining at American Girl. My daughter and I were very impressed with the tea service. My daughter was delighted that her doll had her own chair and her own tea cup. Plus, our napkins were rolled up in pretty bow ponytails that we could take home--one for my daughter and one for her doll! We were welcomed with delicious cinnamon buns. I had my choice of several teas--which I was not expecting, but it was a tea after all! Then, we received a large selection of munchies--cucumber sandwiches, chocolate chip scones, and several other selections. We definitely had more than enough food. The food was presented in a way that was child friendly. To my shock, my daughter tried pretty much everything, even learning that cucumbers aren't bad. For dessert, we had three selections. 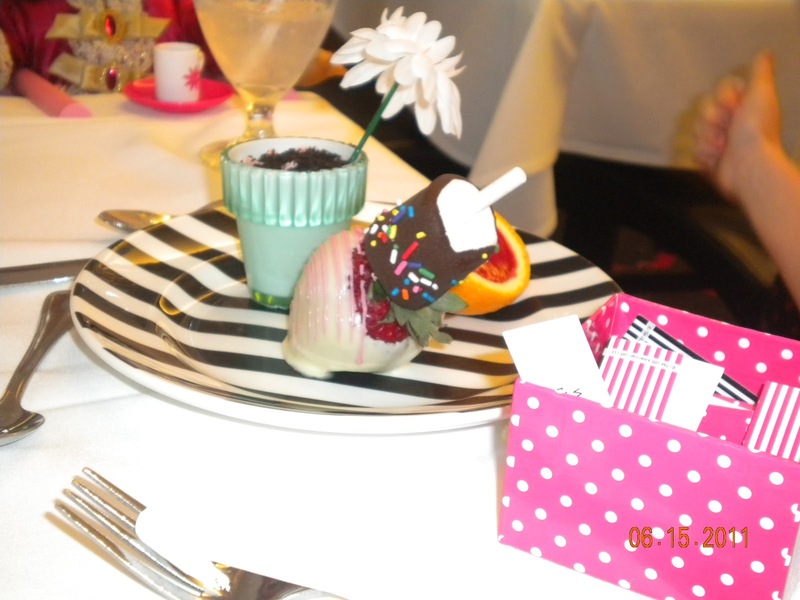 Now, we were already pretty full by the time we received dessert. However, we had no problem devouring the chocolate mousse flower pots! The staff was very attentive and friendly. They had no issue stopping to take pictures during the service, which was nice! The only complaint I really have is that it seemed like we had to wait forever to be let into the dining room. Also, the lobby area near the dining room is a little small for all of the people waiting to be let in for their meal. It is American Girl--of course everyone is going to be early for their seating! However, if you are thinking about going to American Girl Place, I definitely recommend the tea. In fact, writing this is making me want to take my daughter back! 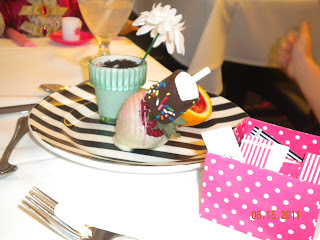 The cost is $18 per person (excluding gratuity and tax) which I didn't think was too bad considering the cost of everything else at American Girl! How cute! My daughter has long since outgrown American Girl dolls, but I wish I had taken her to that when she was younger.